Image: courtesy Stock & Land. Completing the Hay/Jerilderie double for Woodpark Poll, Carol and Stephen Huggins, Eurolie were proud first-time winners of the John Wells Memorial Shield at Jerilderie. They were congratulated on their win by Ross Wells, Willandra, father of John Wells. In a sale lasting only one hour young ewes made to a high of $263 a head in a highly competitive and evenly priced Merino breeders sheep sale at Jerilderie on Friday. Competing for the John Wells Memorial Shield, the Huggins family, Eurolie secured sale honours for the highest priced yard of 1.5 year-olds, with their Woodpark Poll-blood 15-drop ewes sold at $263. This sale was closely followed by the Sleigh Pastoral ewe hoggets, Willandra-blood, sold at $262/head, The Yanko blood and bred ewes sold at $260/head and Donald Bull’s Woodpark-blood, Irroy ewes from Conargo, sold at $258 a head. 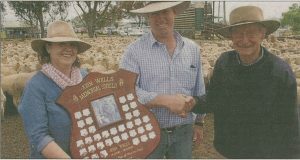 For Stephen and Carol Huggins it was their first-ever win of the prestigious John Wells Shield which has been highly prized among the district’s prominent sheep breeding community. It also capped of a special month sales for Woodpark Poll Stud as it collected a major double snaring also the highest priced line at Hay’s Merino breeder sales, where David and Barbara Butcher, Mossgiel sold their Bronte-bred, Woodpark Poll ewes to the Hay top of $274 a head. Seven breeder’s lines sold at prices above $250 a head in the Jerilderie line-up while four out of its six lots of five year-old ewes secured prices between $150 and $160. However the sale of 8000 offered merely one-third of the number it yarded and cleared in this fixture last year when 22,000 head came forward. Riversdale sold 365 Woodpark Poll-blood, Riversdale-bred, August-shorn five year-olds at $158. Image: courtesy The Weekly Times. 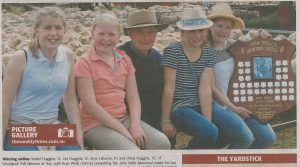 Winning smiles: Isobel Huggins, 13, Lily Huggins, 12, Skye Lilburne, 10 and Olivia Huggins, 10, of Woodpark Poll Merinos at Hay, with Ross Wells (centre) presenting the John Wells Memorial shield for the top price pen. 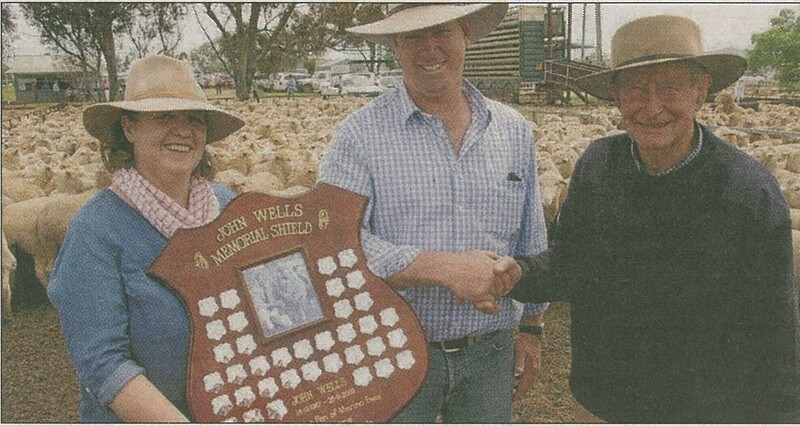 Numbers were less than half of last year, and prices jumped more than $60 at the Jerilderie Merino ewe sale. About 8000 ewes were offered by Elders last Friday, compared to 25,000 in 2015, and prices reached a high of $263 for 18-month-old Merinos. Elders auctioneer Jason Andrews said the yarding number was affected by the weather, and the water coming down the creek system at Jerilderie. “I can’t say it enough, anyone who wants to buy sheep in the Riverina we probably have another month where we are going to have numbers of sheep coming about, and then our spring sales will be over,” he said. All but one pen (which had fewer than 200 sheep) in the first 15 made $250 or above, and the remainder of the young ewes sold from $118 to $244. “The prices were very, very strong, particularly repeat buyers on the sheep they have been buying out of Jerilderie for a number of years,” Mr Andrew said. 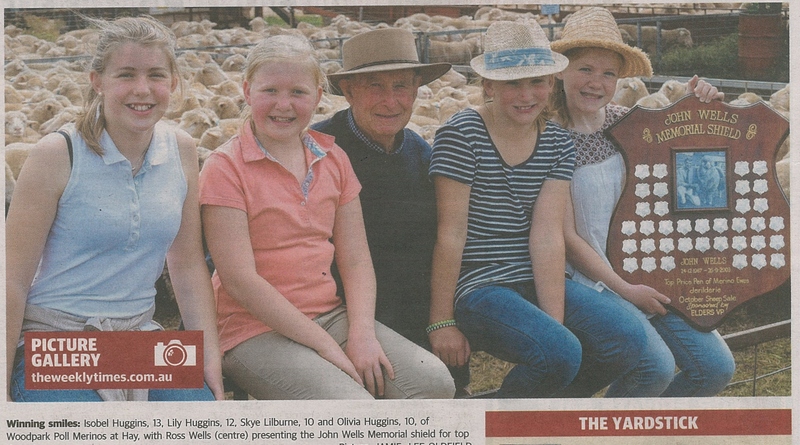 This was the case for the vendors of the top-priced pen, and winners of the John Wells Memorial trophy, the Huggins family of Woodpark Poll Merinos from Hay. They sold their top line of 559 May-June 2015-drop, August-shorn Merino ewes at $263, to Tungamah producer Laurie Ford. The Woodpark Poll seconds pen then sold to Rodwells Wangaratta at $236, which compared to a $170 averages across the whole line in 2015. Woodpark co-principal Stephen Huggins said he didn’t have expectations, but was optimistic given recent stronger sales, and the price was a big improvement on last year.